OMAHA, NE--(Marketwired - November 24, 2014) - Proxibid (www.proxibid.com), the most trusted online Marketplace for buying and selling highly valued items, will provide online bidding for Thomas Del Mar Ltd.'s extraordinary sale of antique arms, armor and militaria on Wed., Dec. 3 at noon Greenwich Mean Time (GMT). This auction features a carefully selected collection of Japanese swords, daggers and spears, along with a handful of rare firearms. Bidders will have the opportunity to bid onsite at the auction in London, England, or online via Proxibid. Online bidding in this auction is already available by visiting www.proxibid.com/thomasdelmar. The items in this sale hail from the armory of Schloss Langenburg, the ancestral seat of the Princes Hohenlohe-Langenburg in Southern Germany. The Hohenlohe-Langenburg bloodline has close ties to Europe's Protestant ruling dynasties, specifically the British Royal Family. 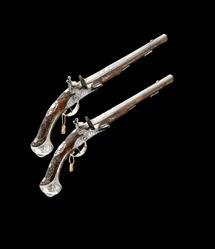 Lot 229: Pair of Bohemian Silver-Mounted Flintlock Holster Pistols by Paul Poser -- The distinguished treatment of the barrels, the locks and the mounts is possibly the work of the Franz Matzenkopf (circa 1705-1776), a celebrated chiseler of iron, silver and bronze who supplied Poser and other Prague gunmakers. Lot 260: Rare 39-bore Wheel-lock Sporting Carbine -- This fine piece was stocked by a stockmaker known as "The Master of the Castles," who remains unidentified by name but was almost certainly working in Nuremberg. He is so-called because of the castles which feature some of his distinctive inlaid compositions. Lot 323: Brunswick State Two-Hand Processional Sword of the Guard of Julius, Duke of Brunswick and Lüneburg -- This lovely piece is a straight double-edged blade of flattened-diamond section stamped with two differing bladesmith's marks. Proxibid provides asset owners of all sizes and buyers with access to the world's most trusted online Marketplace and selling solutions for excess inventory. More than $2 billion in inventory passes through Proxibid's Marketplace annually in product categories that include heavy equipment; commercial and industrial equipment; real estate; fine art, antiques and collectibles and more. Pair of Bohemian Silver-Mounted Flintlock Holster Pistols by Paul Poser -- The distinguished treatment of the barrels, the locks and the mounts is possibly the work of the Franz Matzenkopf (circa 1705-1776), a celebrated chiseler of iron, silver and bronze who supplied Poser and other Prague gunmakers.